Each year a BYU founder is honored at Homecoming in the George H. Brimhall Memorial Essay Contest. Humanities major Emma L. M. Stanford (’20) won the 2018 contest, which recognized the late Raymond E. Beckham (BA ’49), a BYU fundraiser, professor, and administrator. Below is a condensed version of her essay. 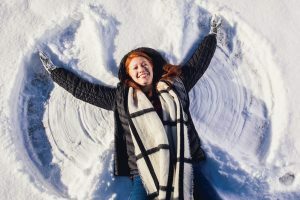 In her winning essay, Emma Stanford discovers her road to becoming an angel began with the great Ray Beckham, BYU’s honored founder of 2018. Photo by Brad Slade. With all of our winter layers, we looked more like Michelin Men than holy messengers as we made our way across the icy parking lot to Calgary’s Heritage Park for the annual nativity pageant. My sister and I, cast as angels, froze each night in our little trailer as we waited for our time onstage. Despite the cold, the experience was incredible: night after night, hundreds of volunteer actors, animal trainers, and technicians put on this nativity tribute for tens of thousands of Calgarians, bringing a Christmas glow to the city. I loved every minute, even when the surface of my teeth began to freeze from over-smiling. I lip-synced the words to Handel’s “Hallelujah” chorus with gusto, proclaiming the gospel message to a mosaic of ward members, strangers, neighbors, and friends. Rewind some 35 years prior to Provo, Utah, where Ray Beckham and his wife, Ida Lee, lived and served, Ray a BYU professor, Ida Lee caring for three young children at home. Unexpectedly, they were called to serve a mission. They accepted, praying to be prepared for wherever the Lord would send them. As a young Canadian student at BYU, I had never heard of Ray Beckham before this essay contest. At the start of my research, I was inspired by his community involvement: Beckham raised money to build some of BYU’s most iconic structures: the Museum of Art, LaVell Edwards Stadium, and the Marriott Center. Although he was an office man, it wasn’t uncommon to see him roll up his sleeves and help lay the foundations himself. The most enduring foundations he laid, however, are not covered in paint or grass. I discovered that Beckham served as mission president in Calgary, Canada—the ever-favorite object of my heart—and suddenly this was no longer just an essay contest. This was my family, my ward, and my home. I tore through his memoir to the chapter entitled “Mission President in Calgary, Canada” and read with awakened excitement, eager to see what this man had experienced in my city. President Ray Beckham had created our nativity pageant? I was speechless. He recalled how he prompted stake leaders to rally their wards and sponsor the 1974 Calgary Nativity Pageant, and how more than 35,000 people attended in the first two years. President Beckham apparently considered this a small accomplishment—it’s just a bullet point in his book. But it is not just a bullet point to me: he laid the foundation for a tradition that my community could build upon long after he left. Ray Beckham’s most enduring foundations are not just of steel and stone. Beckham was inspired to lay foundations where no other person thought to look. He didn’t need to dress up as an angel, as I did, to be a messenger of God. He willingly gave of his time, his resources, and his love to the people of Calgary so that I, years later in my Michelin Man costume, could bring the light of the gospel to just a few more. LaVell threw out the football bible and wrote his own rulebook. The author of this essay of the year follows his lead.